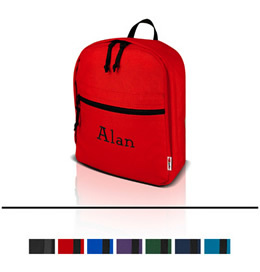 Send your preschooler or first grader off to school with class. A smaller version of our larger packs; the Starter Pack will make your younger kids feel like their older siblings with their own tough, durable version of our backpacks. A large compartment holds books, lunch, and accessories. A zippered slip pocket is just right for pencils and crayons. Adjustable, padded straps provide for a comfortable fit. Monogram it for that special touch!